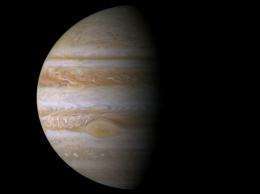 (PhysOrg.com) -- Ten years ago, on Dec. 30, 2000, NASA's Cassini spacecraft made its closest approach to Jupiter on its way to orbiting Saturn. The main purpose was to use the gravity of the largest planet in our solar system to slingshot Cassini towards Saturn, its ultimate destination. But the encounter with Jupiter, Saturn's gas-giant big brother, also gave the Cassini project a perfect lab for testing its instruments and evaluating its operations plans for its tour of the ringed planet, which began in 2004. "The Jupiter flyby allowed the Cassini spacecraft to stretch its wings, rehearsing for its prime time show, orbiting Saturn," said Linda Spilker, Cassini project scientist based at NASA's Jet Propulsion Laboratory in Pasadena, Calif. "Ten years later, findings from the Jupiter flyby still continue to shape our understanding of similar processes in the Saturn system." Cassini spent about six months - from October 2000 to March 2001 - exploring the Jupiter system. The closest approach brought Cassini to within about 9.7 million kilometers (6 million miles) of Jupiter's cloud tops at 2:05 a.m. Pacific Time, or 10:05 a.m. UTC, on Dec. 30, 2000. Cassini captured some 26,000 images of Jupiter and its moons over six months of continual viewing, creating the most detailed global portrait of Jupiter yet. While Cassini's images of Jupiter did not have higher resolution than the best from NASA's Voyager mission during its two 1979 flybys, Cassini's cameras had a wider color spectrum than those aboard Voyager, capturing wavelengths of radiation that could probe different heights in Jupiter's atmosphere. The images enabled scientists to watch convective lightning storms evolve over time and helped them understand the heights and composition of these storms and the many clouds, hazes and other types of storms that blanket Jupiter. The Cassini images also revealed a never-before-seen large, dark oval around 60 degrees north latitude that rivaled Jupiter's Great Red Spot in size. Like the Great Red Spot, the large oval was a giant storm on Jupiter. But, unlike the Great Red Spot, which has been stable for hundreds of years, the large oval showed itself to be quite transient, growing, moving sideways, developing a bright inner core, rotating and thinning over six months. The oval was at high altitude and high latitude, so scientists think the oval may have been associated with Jupiter's powerful auroras. The imaging team was also able to amass 70-day movies of storms forming, merging and moving near Jupiter's north pole. They showed how larger storms gained energy from swallowing smaller storms, the way big fish eat small fish. The movies also showed how the ordered flow of the eastward and westward jet streams in low latitudes gives way to a more disordered flow at high latitudes. Meanwhile, Cassini's composite infrared spectrometer was able to do the first thorough mapping of Jupiter's temperature and atmospheric composition. The temperature maps enabled winds to be determined above the cloud tops, so scientists no longer had to rely on tracking features to measure winds. The spectrometer data showed the unexpected presence of an intense equatorial eastward jet (roughly 140 meters per second, or 310 mph) high in the stratosphere, about 100 kilometers (60 miles) above the visible clouds. Data from this instrument also led to the highest-resolution map so far of acetylene on Jupiter and the first detection of organic methyl radical and diacetylene in the auroral hot spots near Jupiter's north and south poles. These molecules are important to understanding the chemical interactions between sunlight and molecules in Jupiter's stratosphere. As Cassini approached Jupiter, its radio and plasma wave instrument also recorded naturally occurring chirps created by electrons coming from a cosmic sonic boom. The boom occurs when supersonic solar wind - charged particles that fly off the sun - is slowed and deflected around the magnetic bubble surroun ding Jupiter. Because Cassini arrived at Jupiter while NASA's Galileo spacecraft was still orbiting the planet, scientists were also able to take advantage of near-simultaneous measurements from two different spacecraft. This coincidence enabled scientists to make giant strides in understanding the interaction of the solar wind with Jupiter. Cassini and Galileo provided the first two-point measurement of the boundary of Jupiter's magnetic bubble and showed that it was in the act of contracting as a region of higher solar wind pressure blew on it. "The Jupiter flyby benefited us in two ways, one being the unique science data we collected and the other the knowledge we gained about how to effectively operate this complex machine," said Bob Mitchell, Cassini program manager based at JPL. "Today, 10 years later, our operations are still heavily influenced by that experience and it is serving us very well." In celebrating the anniversary of Cassini's visit 10 years ago, scientists are also excited about the upcoming and proposed missions to the Jupiter system, including NASA's Juno spacecraft, to be launched next August, and the Europa Jupiter System Mission, which has been given a priority by NASA. The Cassini-Huygens mission is a cooperative project of NASA, the European Space Agency and the Italian Space Agency. JPL, a division of the California Institute of Technology in Pasadena, Calif., manages the mission for NASA's Science Mission Directorate, Washington, D.C. The Cassini orbiter and its two onboard cameras were designed, developed and assembled at JPL. The imaging team is based at the Space Science Institute in Boulder, Colo. The composite infrared spectrometer team is based at NASA's Goddard Space Flight Center, Greenbelt, Md., where the instrument was built. The radio and plasma wave science team is based at the University of Iowa, Iowa City, where the instrument was built. "it's now planned to keep going until 2017 (when it will plunge into Saturn due to orbital perturbations.)" I've read that mission planners were looking at several end-of-mission scenarios wrt to Cassini including atmospheric impact with Saturn (with a possible pass inside or through the inner rings! ), escape from Saturn to impact another gas giant planet or entering into a 500yr stable orbit within the Saturnian system (at 2017 or later). I had thought they were going to wait until later in the mission to make a final decision. Sometimes we get what we pay for and so much more. Cassini is providing a very nice return on investment. NASA gets a lot of criticism, some of it justifiable but rarely do they receive praise for the successful missions that advance our understanding of the universe we all share.